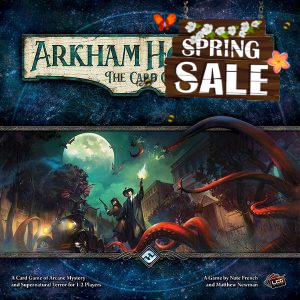 Designed for one to eight players, Arkham Horror is a cooperative adventure game of survival, horror, and investigation. A terrible creature from beyond time and space—an Ancient One—is awakening, roused by dimensional gates that open across the city. 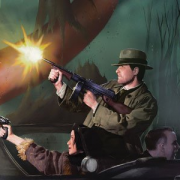 Players take on the role of investigators, each with a unique backstory, abilities, and equipment. Joining forces, the investigators must secure the city, encountering its haunted and mysterious locations before the Ancient One awakens. If the Ancient One awakens and defeats the players in the final battle, all of Arkham is doomed. 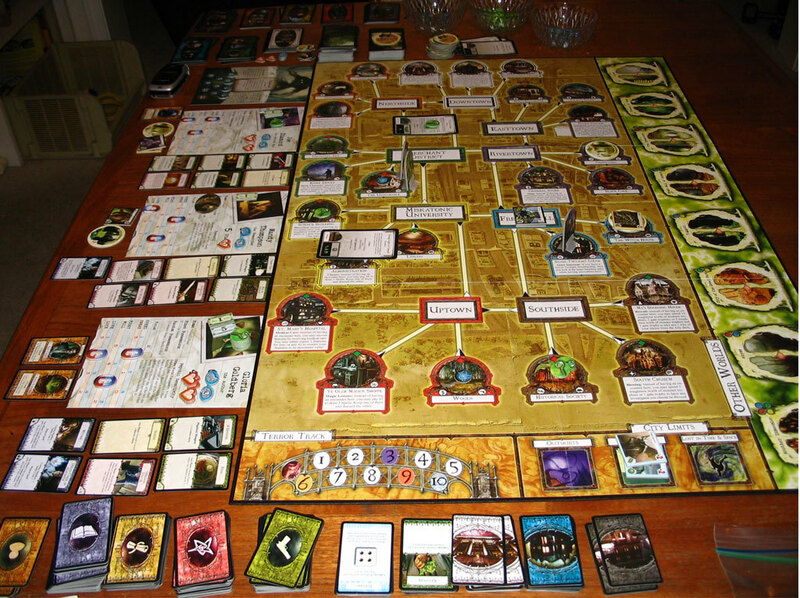 In order to win the game, players work together to keep the Ancient One at bay by closing gates that allow travel between Arkham and the perilous Other Worlds. 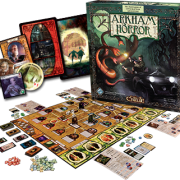 Investigators move around the city gathering the weapons, spells, clues, and other items they need not only to close gates and defeat the Ancient One, but also to survive Arkham’s monster-infested streets. The more gates remain open, the more monsters come through them to swarm the city and the stronger the Ancient One grows. If enough dark powers gather in Arkham, the Ancient One’s long slumber will come to a sudden and frightening end. In this city filled with dangers, investigators might not make it through a single night on their own. But together, these unlikely heroes may stand in the very presence of an Ancient One and live to tell tales about their fearless actions in the face of unspeakable horrors. 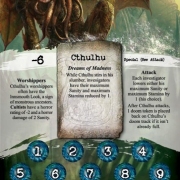 Arkham Horror features a unique way for players to customize their investigators. 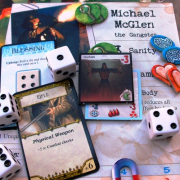 Each investigator has three pairs of two skills which can be adjusted throughout the game. At the start of every turn players have the opportunity to adjust their skills so that they have the right abilties for their circumstances. However, when you change one skill, the skill paired with it is affected. If you prefer to have extra speed for a turn, don’t expect to sneak by any enemies during your encounters. Maintaining a flexible balance is key. There is no shortage of the macabre in Arkham. 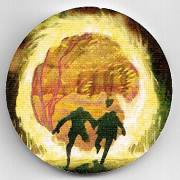 Investigators are pitted against the followers of the Ancient Ones, be they human or otherwise. Their enemies will not only challenge them physically, but mentally as well. Every investigator has a sanity threshold as well as a stamina threshold, representing the punishment their minds and bodies can take, respectively. 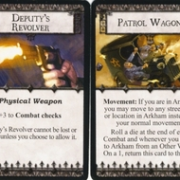 Investigators need to arm themselves with whatever weapons they can find, ranging from guns to spells to enchanted relics. These items can be found throughout Arkham, in shops, chance meetings, and even in alternate dimensions! As the Ancient One stirs, gates spawn all over Arkham, spilling monsters out into the streets. When enough of these gates open, the Ancient One will be able to overrun Arkham and the investigators will have no hope of saving the town. In order to put an end to the encroaching darkness, investigators will have to close the multiplying portals that link our world to the beyond. 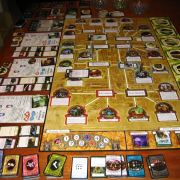 To close these gates the investigators must gather clues, investigate alternate dimensions, and then return to Arkham to close the gates. If they gather enough clues, they permanently seal the location so no more gates can be spawned. Enough of these seals ensures that the Ancient One remains dormant and Arkham is saved… for the time being. 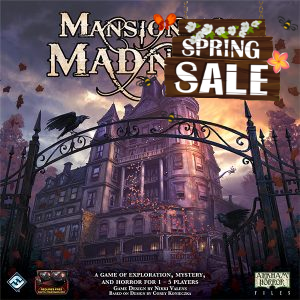 If the investigators are unable to close all the gates, monsters swarm the streets and the Ancient One grows stronger. If enough dark power gathers in Arkham, the Ancient One’s long slumber come to a frightening end. As havoc ensues in Arkham, the Ancient One gathers more power. With each catastrophic event, the investigators come one step closer to encountering a being so terrible and indescribable that they will be fortunate if its very presence does not completely destroy them. 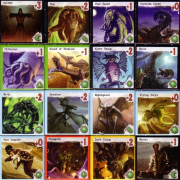 Ancient Ones serve as the main antagonists for each game of Arkham Horror, and each one changes gameplay drastically. Not only does each Ancient One have its own unique and destructive power, but their followers gain additional abilities as well. Can you defeat these cosmic evils and forestall the doom that waits for Arkham?